In 2018, on February 28, “Haykyan-2017” award ceremony was held at the National Academic Opera and Ballet Theater named after A. Spendiaryan, attended by RA President Serzh Sargsyan, Coordinator of Youth Foundation of Armenia Karen Avagyan, high-ranking officials, representatives of student and youth organizations, guests. 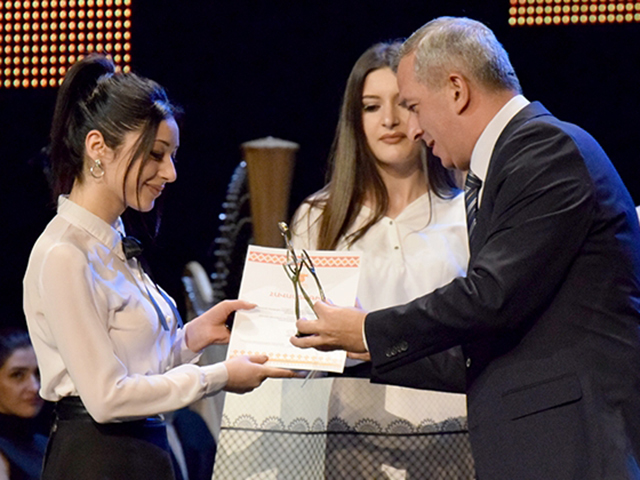 “Haykyan” Award is a program implemented already 17 years by the Armenian Youth Foundation aims to activate student self-governing structures, to encourage student initiatives, to raise the degree of integration of the youth in the sphere of science, to deepen international cooperation and to develop activities in youth policy. Young people, youth groups and organizations that had excelled and come up with innovative undertakings in 2017 were awarded in different nominations. Karen Avagyan assured that the program was of paramount importance because it was the best example when young people were awarded for their hard and dedicated work. He also underlined that the choice was increasingly difficult, and the programs were becoming more and more and it was difficult to choose winners for “Haykyan” Prize. Approximately 40 applications were submitted in 11 different nominations to take part in “Haykyan-2017” award ceremony. YSU IB Student Council also submitted an application. The winners’ names became clear only during the award ceremony. YSU Ijevan Branch Student Council was recognized as the winner in the nomination “The Best Regional Student Self-Governing Body”. Among the participants of the award ceremony were YSU IB Student Council Chairman Iskuhi Shaghbatyan and Student Council members Zara Vartanyan, Ani Asryan and Arpine Veranyan. Iskuhi Shaghbatyan received an award by RA Deputy Minister of Sports and Youth Affairs Arsen Karamyan. 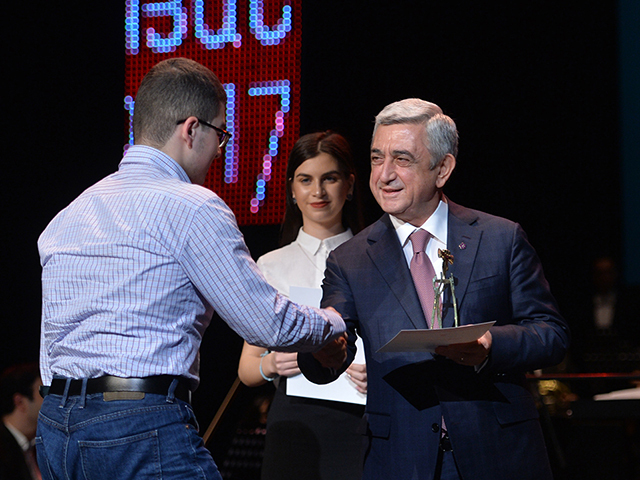 Shaghbatyan welcomed the President, the guests and congratulated all the winners. She thanked all the Student Council members, all the staff of the branch for their support, the Youth Foundation of Armenia, in particular the jury of “Haykyan” Awards, for the best evaluation of the work done. In addition to pre-determined nominations, the President of the Republic awarded 8 special awards. The winners received symbolic statuettes, certificates and precious gifts. 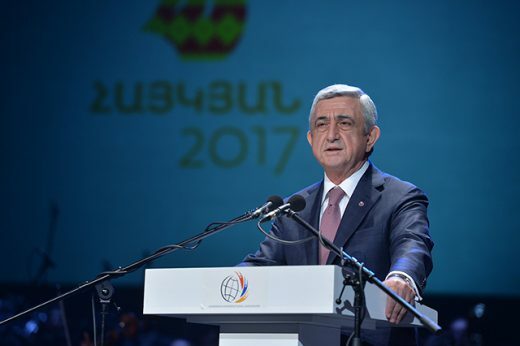 At the end of the award ceremony, President Serzh Sargsyan congratulated the winners, wishing them ever new achievements, expressing the hope that the awards they received today would become the components of a long chain of success for the sake of Armenia and the Armenian people. The event was accompanied by a concert program. 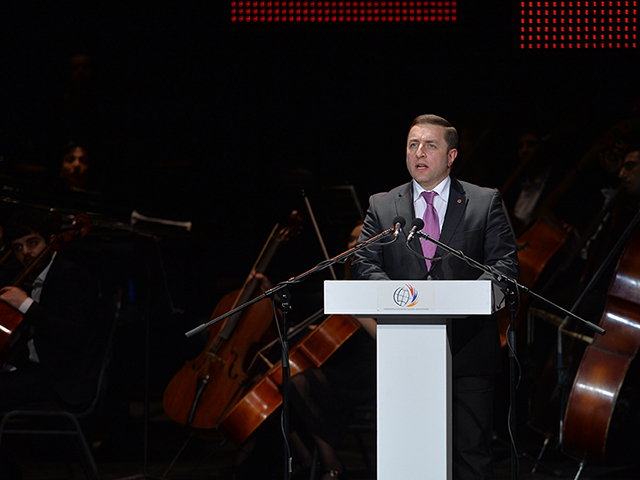 Armenian State Symphonic Orchestra (artistic director and principal conductor, Sergey Smbatyan) and famous singers performed during the evening.